The lovely shop of Antiek De Hoog Groaf is located in front of the ruins of the Roman wall in Tongeren, the oldest city of Belgium. This appropriate setting is also the decor for the big antique market every Sunday. With a lot of imagination and creativity, this building was transformed into an Antique Hall with character, fascinating ambiance and surprising combinations. On the outdoor lawn at the back of the store, you discover a maze of old materials, sure to inspire you with new ideas for residential-and garden-refurbishments. Several years already, a lot of energy and creativity is spent on custom furniture. Hans and Maarten found a new challenge and since then many beautiful designs were realized. 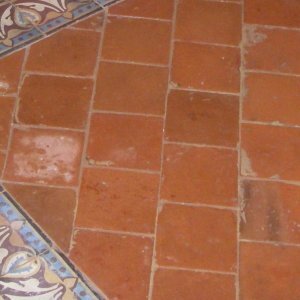 Old ceramic floor tiles or cement tiles with art-nouveau motif or other, fur colored or sober. Look for the newest tiles in the "NEW ARRIVALS" menu-tab. This summer we have 10% discounts on all floorings! 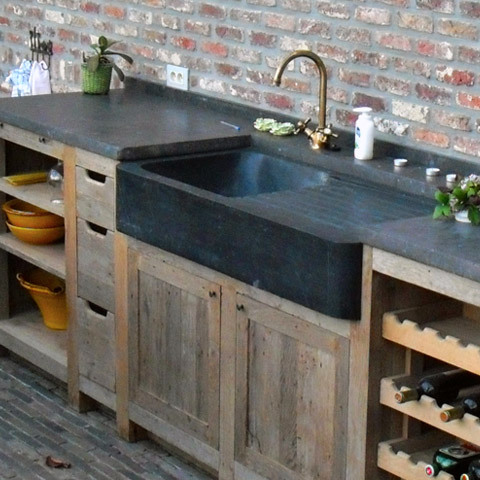 1 of our kitchens in the magazine "WONEN", Country Style.